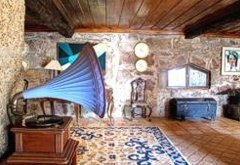 This Manor House is of great architectural beauty and stands in its own vineyards close to the beautiful, old town of Amarante. Amarante has bars and restaurants and old wooden balconies jutting out over the river where pedalos and rowing boats are used by tourists. The more adventurous may like to try canoeing or white water rafting. The 'festa of Sao Goncalo' is held on the first weekend in June and its ancient fertility customs probably date to before Christianity came to Portugal. It is the custom for the local unmarried youngsters to exchange phallus like cakes during this period as a token of their love. 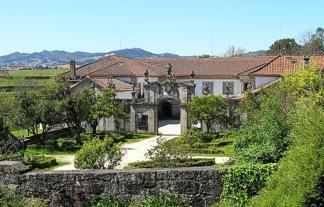 The 'Casa' is near the fine new mountain golf course at Amarante. Guests on these Northern Portuguese courses are able to play at considerable lower rates than the Algarve courses and at times to suit themselves. The club house is an excellent venue for golfers and non golfers alike. 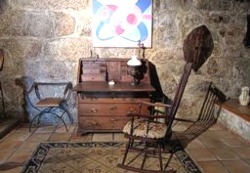 There are strong links with the famous Portuguese poet, Teixeira de Pascoaes and his belongings are now in a museum within the house. The owner lives on the first floor of the house reached by the imposing staircase. 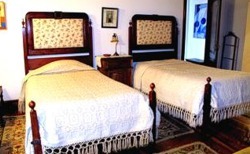 There are four bedrooms each sleeping two persons available in the house. These range from a room with a traditional four poster bed with older style furnishings to more modern rooms. Three of the bedrooms have ensuite bathrooms and the other has an ensuite shower room. The swimming pool is located in the lawned garden. The small backyard has plenty of vineyards and has stone tables where breakfast can be served. Amarante has two impressive natural features, the Marao mountain and the river Tamega. Both offer beautiful landscapes and sceneries that attract many visitors throughout the year. One of the most iconic images of Northern Portugal, commonly found in many travel guides, is the late 18th century Sao Goncalo bridge. Casa de Pascoaes has laundry service, internet, private car park and airport service. Meals can be served upon request in advance.